As I have mentioned before, I am a big fan of the index card. I like their sleek, simplistic nature, and there is just something satisfying about having that one single card to jot down your current ideas or to do list. At the time I ordered these last year, you could buy the 4x6 Levenger Note Cards in a 75-card sampler pack, containing 25 five each of grid, ruled, and blank cards. That option doesn't seem to be available anymore on the Levenger website, but the 3x5 sampler is, as are all of the 3x5 and 4x6 single design options, and all are worth checking out. I tried out several different inks on these cards, and as you might have guessed, some performed better than others. All of the gel ink pens worked great, especially the sub-micro tips like the Pilot Hi-Tec-C 0.25mm and Uni-Ball Signo DX 0.38mm. There was no delay or skipping at all with any of them. The liquid ink and fountain pen ink didn't fare so well. While there wasn't much bleed through the card, there was some feathering as you can notice in the picture. I felt like I had to write really fast with them to make the lines decent. One thing I didn't like is that the cards in the sampler pack were only printed on one side. I think if you order the standard personalized note cards or non-personalized note cards they are printed on both sides, but not every note card description stated that fact, only a few. If I was to reload my stock I would definitely want grids on both sides. The cost of the note cards isn't exactly cheap at $28 per 500 ($5.60 per 100 cards) for lined or grid non-personalized cards, but there aren't a slew of options in the high-end note card realm either. 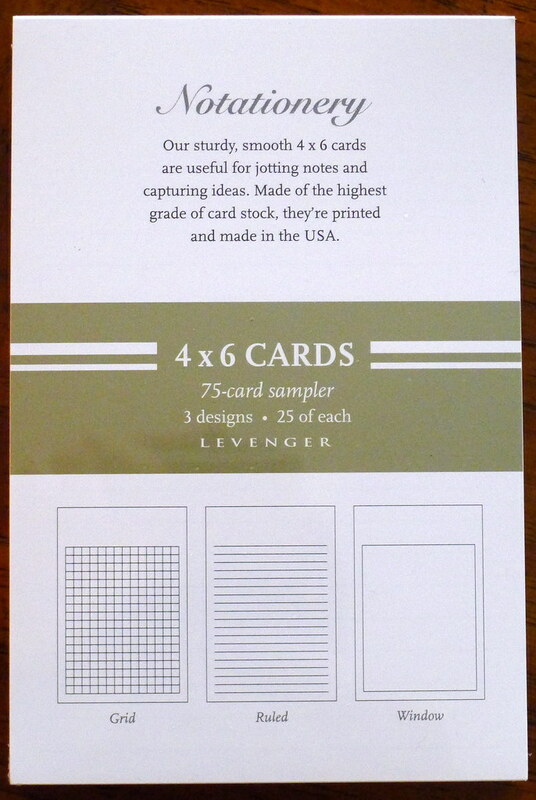 If you are looking for an upgrade over your standard store brand cards, the Levenger Note Cards may be your best bet. Posted on April 4, 2011 by Brad Dowdy and filed under Index Card, Levenger.